A few weeks ago, I wrote in this blog a call to stop paying attention to all the negativity in the news and allowing what is going on in the outside world to have hegemony over your business and personal life. I would like to reinforce that message today, especially with all the chaos and worry with Wall Street, the DOW, government buyouts, etc. etc. Is it realistically that bad? Yes and no. Yes because people, in mass, believe what they’re told; no because the stock market often responds to speculation, rumor, gossip, and fear. If the millions of at-home day traders across the country don’t buy and instead they sell assets for several days, Wall Street panics because there is less cash flow, and when there are more sellers than buyers, people are willing to sell their stocks lower than the other guy down the street, so a lot of stocks go down, and mass panic starts on the stock exchange floors which “pour out” on mainstreet. A car salesman I know was depressed this week because three deals on $45,000 vehicles that were almost completed two weeks ago suddenly stopped, not by the banks lending money but the customers who thought twice about taking on a new debt. So, this car salesman just lost out on the commissions and he won’t be getting the check on Friday he thought he would. Money isn’t disappearing, per se, people are just buying less, backing out on loans, selling off assets for a rainy day, or keeping their money in savings accounts rather than money market accounts. They do so because they hear about the government shelling out $700 billion and California needing to borrow billions more from the federal funds to make payroll. They are worried about what they may owe in 2010, and what shape the economy will be in. The term for this mass panic is often called “voodoo economics,” when ordinary people follow the paranoia of Wall Street based on mostly unfounded information and rumor and a general malaise. Stock brokers working the floor and phones in New York, Chicago, London, and elsewhere have a bad habit of not seeing beyond that week’s accounting period, even if history has told them time again there always periods that will be up, and periods that will be down. 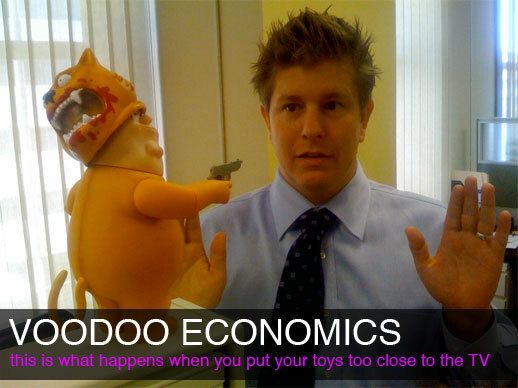 So here is my advice: forget the voodoo economics, forget the gloom, forget the rumors. I know it’s hard, but as I said before, if you simply turn off the TV and don’t read the papers, and get on with our life and your daily business, things will be a lot better for you, your family, and your co-workers. • Stop obsessively logging into your stock trading or 401K account and fretting. Try not looking at it for two weeks; it’s not going anywhere. Chances are what you’ll see in two weeks will be a lot better than what you’ll see today. • Consider buying stocks! This is a buyer’s market. Many stocks that were $2-7 a share three weeks ago are under a dollar now. Bad for companies and brokers, but an opportunity for the smart and adventurous investor. The stocks will go back up by the end of the year. You’ll actually make money. • Exercise. Break out that bike for a morning ride, or job. Go to the gym after work. Exercising has a way of burning off frustration and tension. • Donate to worthy causes. There are so many of them, choosing could be hard. Even if you can only afford right now to click the Red Cross’ Paypal button and send $1, it’s better than nothing. You can donate your old clothes to the Salvation Army—in fact, a clothing drive for S.A. is Ninthlink’s cause for October, and we have a big box here at the office where clothes can be dropped off at. If you can’t make monetary donations, donate your time to one of these organizations, to the churches that feed the homeless, to hospital wings for sick children. Believe me, you will feel a lot better doing this instead of focusing on the bad stuff. • Vocalize positive affirmations in the morning—to yourself, your family, your friends, and of course your co-workers. Say them to your enemy! Try to say nice things to people during the day, you’ll make them smile and help them with their day. If you don’t have time or opportunity to say it, email it. • If you can, try paying off some debt. The banks will like it. But I don’t just mean paying off credit cards or school loans. Do you owe someone a personal debt for a kind act or word they did for you, do you owe a debt of loyalty, friendship, for “having your back” when times were tough, for “being there” at the right moment? Looking for a way of paying these aesthetic debts back (sometimes called “paying it forward”) will go far—these positive actions will push all the negativity back where it belongs: in the shadows. Suggestions for further ways to lead a more positive life are welcome. Add them into the comment box below. Previous PostBlanket and Towel Drive Starts TODAY! Thanks for the Acts of Positivity…I’m going to share with every patient tomorrow!